In the average angler’s mind cactus and trout don’t mix. Meanwhile, in Texas Hill Country, Texas Parks & Wildlife is giving anglers more than 17,750 reasons to not believe it. Contrary to popular belief, there’s plenty of spectacular seasonal trout fishing available to Lone Star State anglers. Dozens of small lakes, ponds, rivers and creeks maintain trout populations in the winter and early spring along the I-35 corridor between San Antonio and Waco and while Southside Park Ponds not too far from The Alamo gets hammered by anglers, the pinnacle of Hill Country trout fishing is the Guadalupe River. Weaving from Canyon Dam through Gruene and into New Braunfels, The Guadalupe River is what many anglers wouldn’t believe existed if they hadn’t seen it with their own eyes. A shallow, yet fairly wide system, this well known tubing and rafting river brings dreams to anglers who from December through March don’t have to drive to New Mexico, Colorado or Arkansas to catch planted trout because cold, clear, clean water rushing out of the base of Canyon Dam keeps the system primed for truckloads of rainbows each week. A shock to some, there’s up to 20 miles of river that harbors planted rainbows and wild browns. The Texas Parks & Wildlife has their hands full given the popularity with anglers from metropolitan areas such as Austin and San Antonio and the smaller, closer cities of New Braunfels and San Marcos. There’s another crowd flocking here too, however, those being travelers from the Midwest trying to avoid the harsh winter. How does the TDFW handle keeping enough trout in the river to combat the daily fishing pressure it receives? Weekly trout plants. While the state of Texas doesn’t raise rainbows in Central Texas, they purchase them from hatcheries in Arkansas and Missouri and rear them locally, allowing them to plant the river with up to 2,000 rainbows each Friday. I flew in from Southern California and met a buddy from Seattle to grasp the true value of angler participation here. In fact, many of my colleagues in the fishing industry didn’t believe me when I told them Texas trout fishing is become a winter staple. We flew in and drove past the hill lined banks of cactus to the scenic river to film Pautzke Outdoors and were shocked at the number of anglers who utilize the fishery. Trips to Cabelas, Walmart, Bass Pro, Academy and other national chains quickly revealed this fishery was no secret to locals, who follow stocking reports closely and are eager to bring home a five-fish limit of planters. What we didn’t have trouble doing was finding willing rainbows. And, while they aren’t going to break any size records, the locals are thrilled with the average eight to 10 inch planter. The downfall to the gorgeous Guadalupe is there’s little public access, almost none. Fortunately, the TP&W has stuck deals with certain campgrounds to enable free fishing access and it’s no secret where those are. Anglers congregate at all of them. 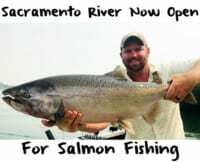 And, while there are much larger holdover and stocked trout in other portions of the river, the vast numbers of planters are released at the following locations. At the base of Canyon Dam, this is the easiest and one of the most popular places to target trout. While you have to walk down a long flight of stairs the hatchery truck can drive and unload hundreds of trout here each week. A concrete fishing area makes for easy access to the trout. Below that, bank access is available. The opposite side also yields access to those walking down the dirt path. There’s always a large concentration of trout here. While this is a private campground, they do open access to anglers, but it can fill early and only a smaller load of trout are planted at this site. You have to check in at the office, before driving in to fish. Likely the most popular place on the river to target trout, crowds build here. While anglers must check in at the camp store (you don’t have to pay anything, they simply jot down your zip code and number in your party so the state can monitor fishing use) are granted plenty of free parking along the bank. The river is planted in the flat behind the trailer park. The best hole is above the rapids and roughly 100 yards below the bridge crossing. Most important, Camp Huaco Springs and Guadalupe Park allow for five fish limits, whereas the others are governed by slot limits and bag limits. Check local fishing regulations before you start to be familiar with regs. The state reports free access also available at Rio Raft and near Whitewater Sports, but fewer trout are planted at these sites and we found it difficult to locate any access points, therefore didn’t fish either. For anglers who don’t mind paying to access a less crowded portion of river, there’s plenty of that available, miles in fact. Just below the second crossing (easy to find on a map) is a campground that charges $5 per angler, granting permission to cast toward much larger trout. The host here showed us photos of trout up to five pounds caught on site (we didn’t catch any of those, nor did other anglers while we were on site). In addition, there are clean restrooms and a place to wash your hands. From the 3rd Bridge Crossing to Whitewater Sports you’ll find ample pay only access, which many fly anglers take advantage of. And, while some disagree that trout don’t live year round here, proof they do exists largely in this section where much larger holdover trout are found and a slot limit exists. One thing you’ll learn quickly about the Guadalupe is while pay access can grant you less crowded holes, unless you arrive mid-week you’ll be sharing the hole with others. This is friendly Texas and whether you like it or not, even if you’ve had the hole to yourself for hours, if someone sees trout in it or watches you catch one, they and their buddies will stand shoulder to shoulder (uninvited) and cast alongside you. Get ready to make new friends. Heading home with a limit of fish is in the cards providing you follow a few simple concepts. Keep in mind, we’d never been here before, knew nothing about fishing for Texas trout and caught and released up to 40 trout a day (and that’s with me filming 95 percent of the time and watching Duane Inglin fish). If both of us were fishing the number could have doubled. 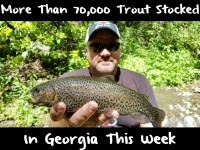 Are we world-class trout anglers? No. We use common sense and apply planted trout fishing techniques used in the Rockies, Appalachians, Sierra and Pacific Northwest. One factor to consider is the water is generally clear (except for the base of the dam where it’s cloudy), which means you’ll want to use light line. 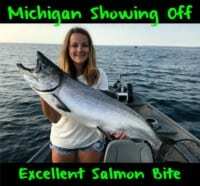 The biggest mistake we saw was anglers using six and eight pound test and then wondering why we were getting bit every cast and they weren’t. Using two and four pound monofilament line is ideal. These are small trout. There’s no reason for anything larger. While anglers did catch fish with dough bait and spinners, our frequent strikes came drifting Pautzke salmon eggs. The Gold Label, Silver Label, Orange Deluxe and Premium drew easy limits for us, and the anglers we left jars with after finishing filming. It was almost too easy with salmon eggs, proving that even though these trout live in Texas, they eat what every other trout eats. Editor’s Note: Chris Shaffer is the Director of Operations for Pautzke Bait and will be trout fishing in the Nashville area this week filming Pautzke Outdoors. When taking a lunch break from catching trout he recommends BBQ at Rudy’s or Cooper’s in New Braunfels.